Your bathroom tile design must match your decorating theme, answer the practical requirements and enhance the other elements in your bathroom. 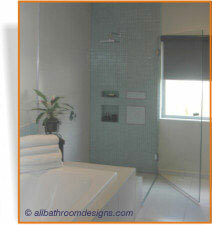 We'll showcase a minimalistic use of bathroom tiles, where the areas to be treated with tiles are carefully considered. On the other side of the spectrum, we'll take a look at the full treatment: floor and walls treated with tiles. the backsplash of the vanity and tub and on one wall of the shower. The choice of color for the tiles is a perfect match for the glass vessel sinks - which is also repeated in the etched glass door of the storage cabinet and frameless glass shower door. The use of color in the tiles is kept to the minimum. This allows endless opportunity to introduce seasonal colors with a change of towels, bathroom rugs and accessories. With so much of the wall areas untreated, a complete color change is so easy to achieve by painting them whenever the mood takes you - at minimal cost. Note: Bathroom paint is especially manufactured to deal with high moisture levels and to be resistant to mold, so large areas of the bathroom can be painted. Where do you need to use tiles i.e. to cope with direct water or spills. How big an area do you want to cover and will it be in balance with the other walls and the fixtures on that wall. - position of a window, etc. The eye very quickly picks up lines that are not related with others. This can be random and disturbing. You can achieve a totally harmonious look by cladding the entire bathroom (except the ceiling) with bathroom ceramic tile. Being a long-term (and costly to replace) treatment, you need to be sure of the style of the bathroom tiles and your choice of color. Although a large expanse of ceramic tile is being used, it also has a minimalistic approach as to texture, color and use of accent tiles. This creates a uniform background where the fixtures, fittings, decorating elements and storage furniture become the major players. 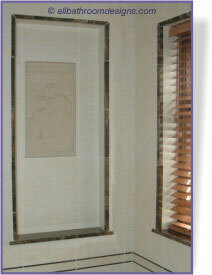 The tub surround is a rich burnt umber marble. The accent tiles match perfectly and are used sparingly to add finishing touches to windows and to emphasize architectural features. 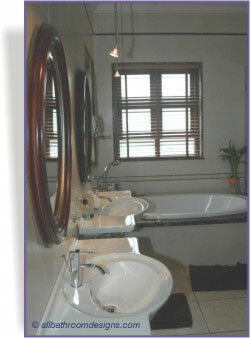 Wooden window blinds, mirror frames and cabinets add warmth. Once you've decided on your overall bathroom tile design, the fun of choosing the perfect tiles starts.